Live on Kickstarter, Tiltcard is the revolutionary new smartphone and table stand that fits in every wallet. Tiltcard, the revolutionary new credit card sized smartphone and tablet stand that fits in every wallet, is live on Kickstarter and has already reached its campaign raise goal. 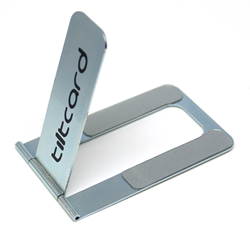 Tiltcard’s industrial and sleek design stands out among it’s competitors. 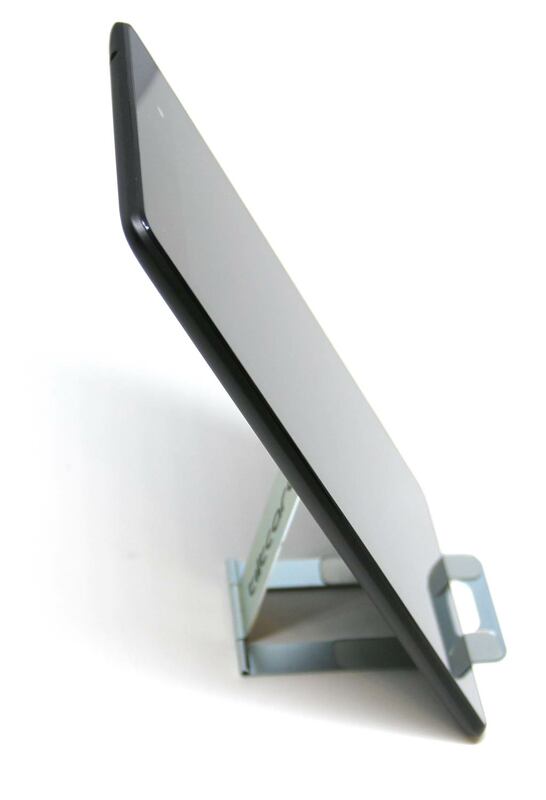 The stand folds flat when not in use allowing for instant access, and the ultimate in portability. And portable it is. Measuring the size of a credit card at approximately 2” x 3.25,” when not in use, the stand folds flat and slides in perfectly with the rest of the cards in the wallet. With one single motion, the Tiltcard can be opened adjusted for optimal viewing angle as a stand for smartphones in either portrait or landscape mode. 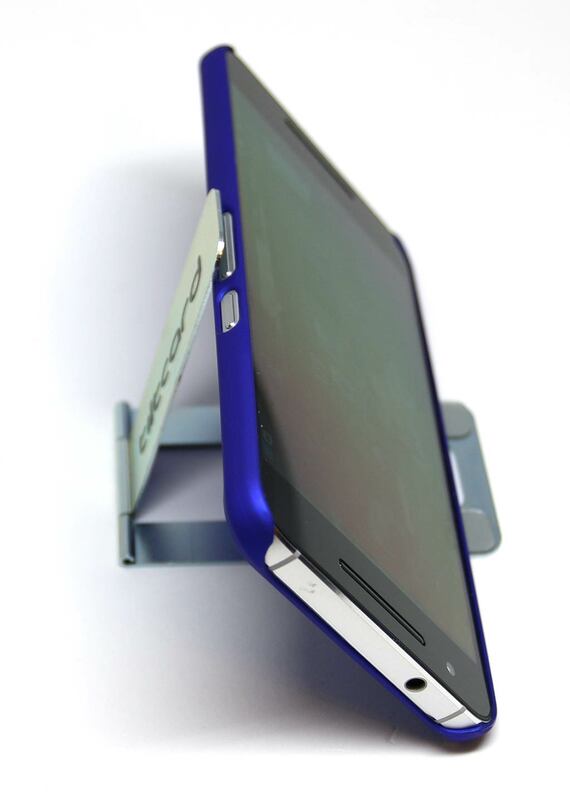 The patent pending design uses a press fit hinge to support multiple mobile devices with and without cases. 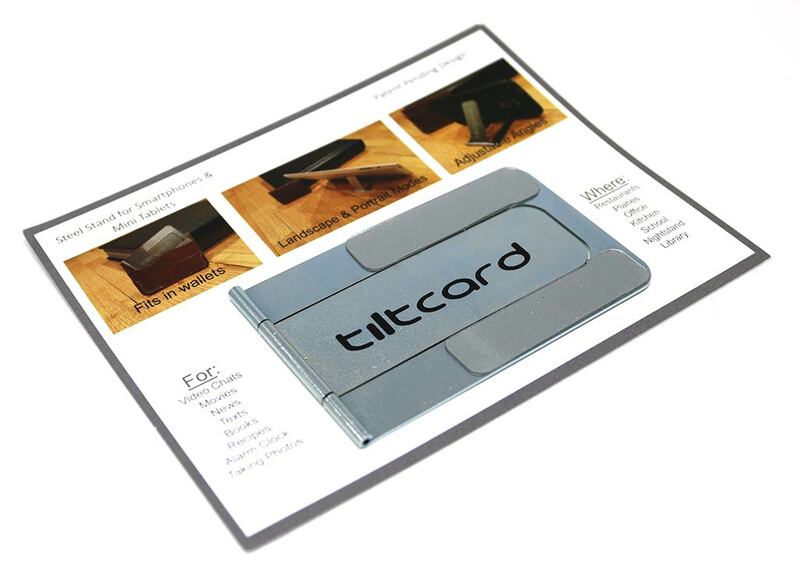 Tiltcard is made out of sleek industrial strength steel and the craftsmanship is easy to see. With no sharp edges on the entire design, the stand is completely kid friendly in both material and ease of use. When two Tiltcards are combined, they are even capable of holding a larger tablet upright. Tiltcard is also striving to be the business card of the future. The company plans to allow these stands to be completely customizable and personalized for companies and brands to engrave them with their logo or other insignia. Tiltcard is an industrial design company focused on creating products that complement user’s technology devices. Their first product, the TiltCard is a wallet sized, sleek, steel stand that is capable of holding smartphones and tablet devices for easy viewing and usage.